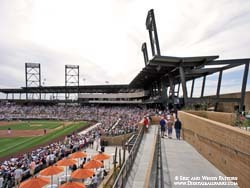 There are so many stunning $100 million dollar ballparks throughout the Phoenix area that are only used during the 6 weeks of Spring Training. It seemed to be such a waste to have these beautiful baseball stadiums sitting here vacant all season long. 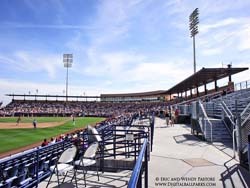 While the temps will peak in the triple digits during the summer, in the fall there is no nicer place to be than the Arizona Fall League when all of these dormant Spring Training baseball stadiums ramp up once again and put on a show. It is perhaps the biggest and most prestigious show of all. 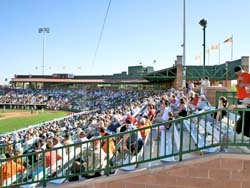 The Arizona Fall League is the best of the best prospects in all of baseball going head to head in a 2 month long "All-Star Game" of the each Major League franchise's best future superstars and you won't want to miss a single game! 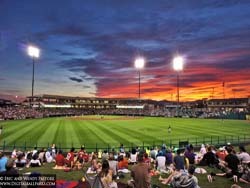 Each ballpark below has its own full collection of photographs. 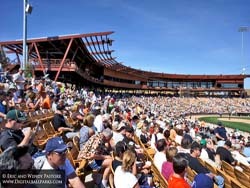 Click any photo below to see that stadium's photo gallery.